If it was easy to eat only when we’re hungry and stop when we were sufficiently full, we’d all be the perfect weight for our individual bodies. Our bodies do have mechanisms that should allow us to do just that, but many of us eat when we aren’t hungry, continue to eat after we’re full, and fall prey to cravings and mindless or emotional eating. It shows itself in many forms: eating because you’re tired, bored, anxious, lonely, uncomfortable, and even happy – they all count as emotional eating. That out of control feeling can happen to anybody at any weight. Getting emotional eating under control may not make a difference just in your weight, but it can give you a greater sense of peace about food, and your body image as well. We all want to be the healthiest we can be, physically, mentally, and otherwise, so how do we stop this behavior? I believe it begins with simply pausing before ANYTHING goes in your mouth, and ask yourself if you are truly hungry. It sounds so simple, and frankly, once you build the habit, it is. Literally ask yourself, “Am I hungry?” Take a moment to decide if what you’re feeling is hunger, or something else. If it’s real hunger, prepare a meal or snack that’s suitable for the time of day and amount of hunger you’re experiencing. 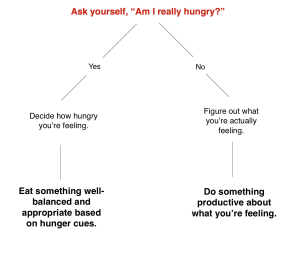 Do you need help figuring out how hungry you are? 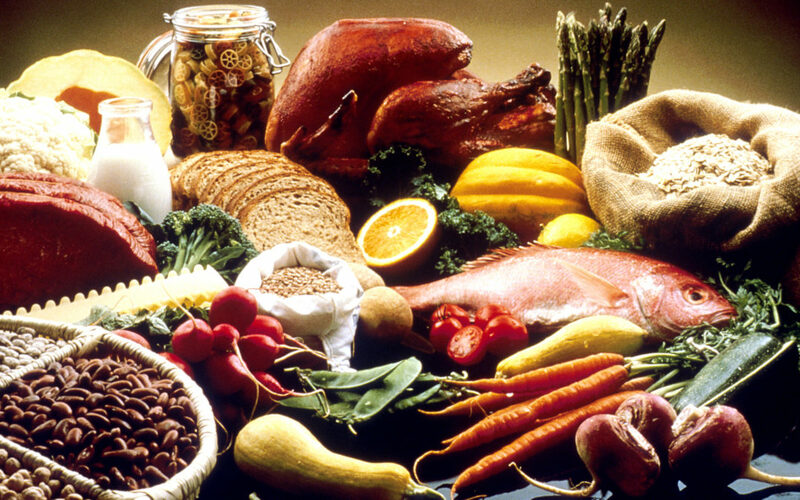 Guess what – there’s a hunger scale! If, during that pause, you discover that you’re actually experiencing something that’s not hunger (boredom, anxiety, loneliness, fatigue, etc), take actions that make sense based on that feeling. For example, you want to reach for some chips, but during that pause you discover that you’re actually bored and a bit lonely. Well, call a friend, go for a walk, write a letter (remember those? ), get your creative juices flowing by making something. Maybe you decide you’re anxious about an upcoming deadline; create a to-do list so you can start checking things off. Stop it with with all-or-nothing thinking! Emotional eating is so often attached to a feeling of whether we’ve been “good-enough” for the day. You feel like somewhere along the line you messed up, so you say “to hell with today” and eat a whole carton of ice-cream (I’m not the only one who’s done that, right?). Don’t get on that destructive thought process train! There’s no such thing as “perfect,” so don’t let one moment result in a wasted day. Every moment is a new opportunity; you don’t have to wait for a new day to begin again! Eat mindfully. It might not be hunger, but thirst you’re feeling, so have a glass of water first. Let eating be its own activity, so turn off the TV, step away from the computer, don’t eat while driving. You’ll be much more likely to eat well when your cupboards are stocked with healthy foods, so don’t wait too long to grocery shop, and don’t fill your kitchen with foods that are your personal triggers (this is why you’ll never find chips or ice cream in my house; I absolutely cannot be trusted with them). Reach out. Don’t be afraid to ask for help if you feel like your emotional eating has gotten out of control. Sometimes all it takes is a conversation with a trusted friend or loved one, or a qualified fitness or nutrition professional. Improving our relationship with food is a process, so don’t beat yourself up if this takes time, and your results aren’t immediate. Celebrate your successes, and learn from your struggles as you continue to move forward and make improvements. Please be compassionate and kind to yourself, and remember to slow down, and listen to your body and what it’s trying to tell you.